Above: Margaret Flowers puts door hanger featuring Ajit Pai on his neighbors door. Hundreds of door hangers were distributed in Pai’s Arlington neighborhood. Photo by Anne Meador May 7, 2017. Note: Popular Resistance’s new campaign, Protect Our Internet (see website and Facebook page – like it) took action on Sunday May 7, 2017 when a group of net neutrality supporters visited FCC Chair Ajit Pai’s Arlington, VA neighborhood. Have You Seen This Man? : Ajit Pai door hanger tangled with Verizon cables near his home in Arlington. From DC Media Group. 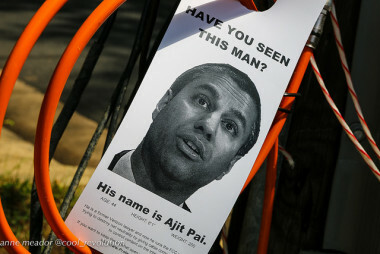 The “Ajit-ation”: Knock, Knock It’s Net Neutrality resulted in hundreds of door hangers being placed on the doors of Pai’s neighbors letting them know their neighbor wants to undermine Internet freedom. The advocates received friendly support from the neighbors they spoke to. They, like the vast majority of people in the United States, understand that net neutrality is essential for a free and open Internet. Pai’s proposal would allow a handful of massive telecoms to control access to the Internet without being content neutral. These widely unpopular corporations could give special privileges to other business interests and pick winners and losers rather than continue to have equal access and services for all. Comcast, which owns NBC/MSNBC could get special privilege, as could Verizon’s Huff Post. Start-up businesses and entrepreneurs would have a difficult time creating new businesses and challenging existing big business interests. Big media corporations, already concentrated with a handful of owners would dominate and diminish independent, non-profit and social media. The innovation and vitality of the Internet would be undermined. The campaign will hold actions at both Pai’s home and the FCC. Next Sunday from 4 to 6 PM Protect Our Internet will be hosting a vigil in front of his home in Arlington (4868 Old Dominion Drive). This will be the beginning of a vigil that will continue until the FCC monthly meeting on May 18, 2017. Sign up and get information at Vigil To #SaveTheInternet. On the day of the meeting, Protect Our Internet will be holding a non-violent, sit-in outside the FCC to show our opposition to repealing Title II classification and the net neutrality rules. The Campaign To Save The Internet Goes To Pai’s Home. He Should Expect Escalation. In June 2015, activists from hundreds of groups with both conservative and liberal agendas–backed up by 3.7 million comments submitted by ordinary Internet users—won a huge victory for Net Neutrality. FCC commissioners did not hand over control of the Internet to the big telecommunications companies, as they had wanted to do. Instead, they designated the internet and Internet Service Providers (ISPs) as common carriers. This designation guaranteed everyone free and open access to Internet information, as if they were using a public utility. It was a major provision envisioned for communications under Title II of the Telecommunications Act of 1934, when the FCC was first created. But now, FCC chairman Ajit Pai wants to change all that and revisit the Net Neutrality fight. He recently proposed new rules to strip Internet protections. It would no longer be protected under the Telecommunications Act of 1934. And the telecoms (Verizon, Comcast, AT&T, Time Warner, etc. ), would decide who accesses it, what data speeds they have, and what sites they can visit. Pai is for a “bruising fight,” according to the Huffington Post. Even the former FCC chairman’s counsel believes the FCC will be flooded with a “tsunami” of calls, emails and comments. And if Ajit Pai was paying attention two years ago, he should know that he’s likely to get some house calls, just like his predecessor did. 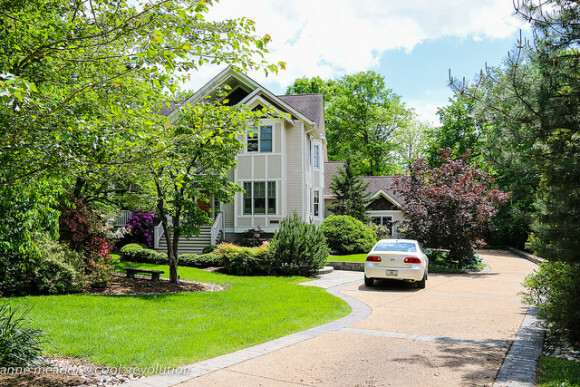 Personal visits to Pai’s 5,300-square-foot house in Arlington, Va.–valued at $1,550,000–began this weekend. The “Ajit-ation” includes a series of protests on the street in front of Chairman Pai’s house planned for next week. They are designed to put some pressure the commissioner, according to Kevin Zeese, one of the activists involved. His group also left a flyer hanging on the front door of Chairman Pai’s house. “Ajit Pai was a Verizon lawyer and is still acting like Verizon lawyer,” said Zeese. “He is not acting like someone who is working in the public interest,” he said. Chairman Pai plans to formally announce the Internet rules changes at the FCC meeting on May 18. The public will have 90 days from that day to make comments on the FCC website. To get involved in the fight for a free and open Internet, visit Popular Resistance, Fight for the Future and Electronic Frontier Foundation.